Notes Roy. Bot. Gard. Edinburgh 45: 134 1988. It grows a swollen bottle-shaped trunk that is well armed with hard conical spines up to 2.5 cm in diameter. Usually towards the end of the wet season, large white or yellowish flowers are produced in great profusion. Origin and Habitat: Ceiba insignis, sometimes still called by the synonym Chorisia insignis, is a deciduous tree native to South Ecuador (Loja), North Peru (Amazonas, Cajamarca, Piura, and San Martin), Argentina, Paraguay, and Bolivia. Habitat and ecology: Dry valleys with semi-deciduous, mainly xerophytic, woodland and savannas. Description: With their thorny markedly ventricose trunks and exotic-looking flowers, the Floss-Silk Trees (Ceiba insignis) are among the most distinctive ornamental trees. 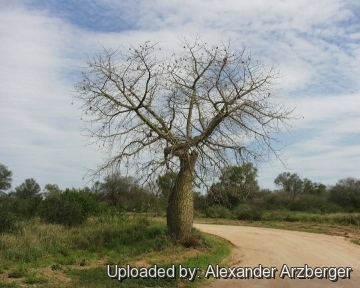 Formerly known as Chorisia insignis, it is notable for its characteristic fat, trunk and branches that are covered with stout spines, more decorative than really frightening, moreover its showy display of large hibiscus-like white to pale yellow flowers when the leaves drop in fall and winter. A mature tree in bloom can be an arresting sight â€” with thorns, flowers, and even seed pods fully displayed on bare branches . In spring and summer the tree is also handsome, covered with a lush foliage of bright green palmately-divided leaves. Because C. insignis is usually grown from seed it is somewhat variable and individuals may vary with respect to spines and trunk form. Mature trees are typically short and stout to around 4-18 metres tall and wide, although some may grow taller (up to 30 metres) and be more open in structure. Derivation of specific name: The name of the species is the Latin word â€œinsignisâ€ = remarkable, extraordinary. Stem: Trunk bottle shaped, straight, more or less convex or enlarged in the lower part with a diameter of 1-2 m which serve to store water at drought times. The wood is tender and porous. The bark is smooth with some stretch marks, green in the young specimen, green-grey or grey in the adult ones. 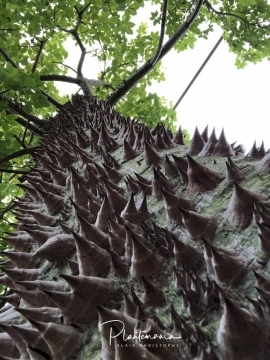 Both the trunk and the branches are covered by conical thorns that can become over 2.5 cm wide as the tree grows and its trunk widens. Leaves:* Alternate, palmately-compound , composed of 5-7 leaflets, these are somewhat coriaceous, oblong-obovate, entire or denticulate, 6-7(-10) cm long and about 4 cm broad, with sharp elongated tip, glossy pale green on the upper side, green-grey in the lower one. The petiole is about 5-12 cm long. Flowers: Solitary, are hermaphrodite and waxy, c. 15 in diameter. Pedicels 15-25 mm long. Calyx bell-shaped. Petals five white, cream-white, or yellowish white with darker longitudinal stretch marks, 8-12 cm long, 2.2-2.5 cm wide, spathulate to narrowly oblong, with only slightly undulate margin, white sericeous to villous externally, glabrous internally, white to pale pink, sometimes with occasional dark reddish striations, with a yellowish zone from mid-length to the base. Staminal tube, showy, about 5 cm long, glabrous below the appendages; the appendage lobes whitish or orange-red, glabrous to sparsely hairy, upper staminal tube glabrous, flushed pink, sometimes splitting distally to give 5 short filaments. In Ceiba insignis the stigma is red pentalobed, papillose and dry. The style is semisolid. Blooming season (South America): Flowering May-July (October). Fruiting time Autumn. Fruit (capsule): Ellipsoidal or pyriform, greenish, 10-15 cm long, and around 5-7 cm wide, dehiscent (when fruits reach maturity, they split open) containing a silky floss coming out of the seeds. Seeds: Numerous black covered in hair, resembling cotton. Similar species: This species is quite similar to Ceiba speciosa, and they may be difficult to differentiate when not in flower. Usually, Ceiba insignis has white flowers with golden throats and Ceiba speciosa's flowers are pink with white throats. However, variation does occur and sometimes Ceiba speciosa may produce paler flowers or C. insignis may have slightly pink flowers. Moreover the flowers of C. insignis have five stamens in the centre, which differentiates it from C. speciosa (besides having shorter and wider leaflets). 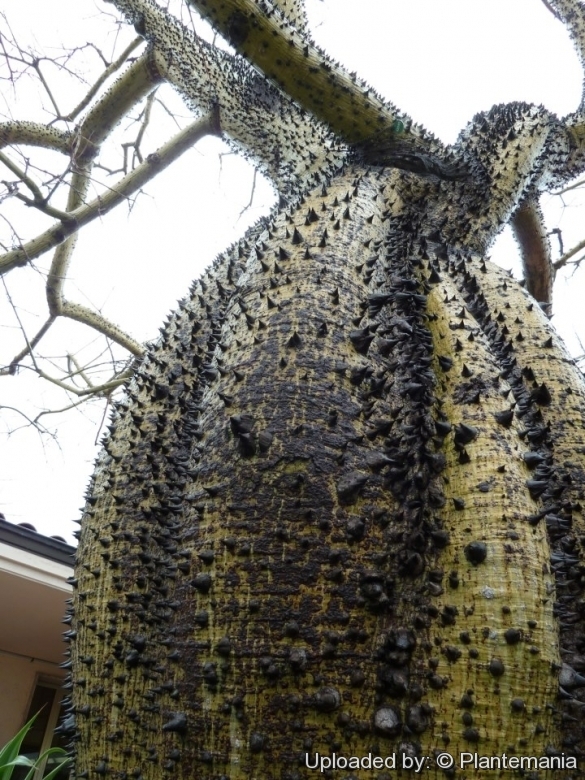 Cultivation and Propagation: Ceiba insignis is quite easily grown from seed and is frequently planted in parks in frost-free climates around the World for its interesting growth form and free-flowering nature. This species is one of the most cultivated of the Ceiba genus, and can put on an impressive floral display in autumn, when the leaves drop. In built-up areas it will prove to be a troublesome one as the roots effect forceful entry into cracks in buildings, roads, drains, etc., and pass through or under and disturb foundations. It grows best in subtropical climate and heavy rainfalls but fairly drought-resistant too. It grows fast in spurts when water is abundant but don't over-water Saplings can be effectively grown in containers for many years before becoming too large and requiring to be planted into the ground. In this manner one can move them out of the cold into a warm position in a glasshouse or indoors behind a sunny window to prevent frost damage. In pot, thanks to the particular shape of its trunk and its superficial roots, it is an appreciated subject of the collectors of caudiciform plants and for realizing bonsai. The spines can be rather easily taken off in the areas where they can represent a damage, at manâ€™s height, even if this, of course, compromises one of its particular characteristics. Soil: Grow it in well draining soils. Watering: Fast growing, it can bear long drought periods, as it stores water, during the rainy season, inside its spongy wood, and suited to monsoon climates with dry and wet seasons, but reach its full size only with ample water availability throughout years. HardinessIt is only semi-hardy and tender when young. The are only suited for tropic, subtropics and warm temperate climates, as it can resist, when adult, for short time to temperatures of -7Â°C . Garden uses: Plant of great landscape value, due to its imposing bottle-shaped, spiny, greenish, trunk, and for its showy, abundant blossoming taking place at the same time of the fall of the leaves. Keep in mind that its rooting apparatus is particularly aggressive and rather superficial, it is therefore to be placed well far from walls, enclosures, sidewalks, sewers, etc. Uses: The silky fibres which wrap the seeds are utilized for stuffing, as replacement of the â€œkapokâ€ (the fibres obtained from the fruits of the Ceiba pentandra ), and for thermal insulators. Reproduction:*** It easily reproduces by seed. Sow in trays, pots, etc. in a well-drained seedling mixture containing one-third sand in a propagator or warm place with a minimum of 25Â°C to a soil depth of 5 cm. The optimum temperature required is 27Â°C, with 30Â°C for maximum germination and plant growth. Seeds are best sown in spring and summer. Germination may take from two to six weeks. It grow reasonably quickly when they are young. It also can be started from cuttings.